Ice, which we generally see around us, is made by freezing the water. Water turns into ice when it is cooled to 32 degrees Fahrenheit (0 degrees Celsius). There is another kind of ice which is known as dry ice. Dry ice is solid carbon dioxide. It is formed when carbon dioxide turns directly from a gas into a solid at a temperature of about -112 degrees Fahrenheit (-80 degrees Celsius). It is so cold that if held in hand it causes frost bite. It is usually prepared by cooling carbon dioxide under high pressure. It looks rather like snow but can be made into blocks by compressing the flakes. Dry ice is very heavy. 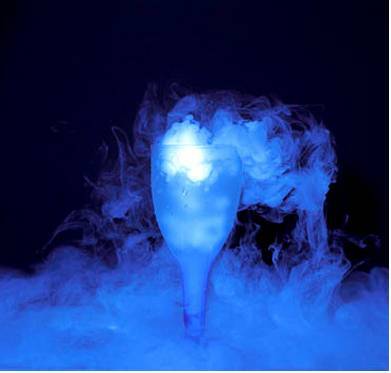 Dry ice is very important for cooling or refrigerating foods such as ice creams and meat and medicines. It is also used to stimulate fog and steam effects in television or stage plays because it rapidly turns back to gas at ordinary temperature without becoming liquid.